Growing a vegetable garden is so much more than just growing vegetables. There is something grounding about tilling soil and watching plants evolve that adds a huge dimension to our lives. For me, it’s very comforting to be surrounded with green bounty. Like a cocoon, or an oasis, rustling leaves and fresh scents add to our home’s nurturing outdoor environment. For this reason, I recommend incorporating fruits and vegetables close to gathering areas. Having vegetable gardens hidden in back corners, cut off from interaction, does not allow its full benefits to shine through. 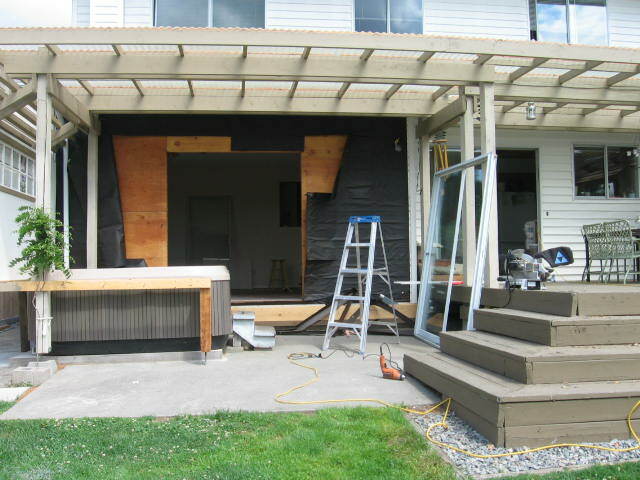 So before I get back to the Pitt Meadows vegetable garden, I need to bring you up-to-speed with our back deck renovation. Our house had its main living space on the ground floor while both of our neighbours had their living space on the upper floor. This posed a privacy delemia for us, as each neighbour could look down on our outdoor activities. 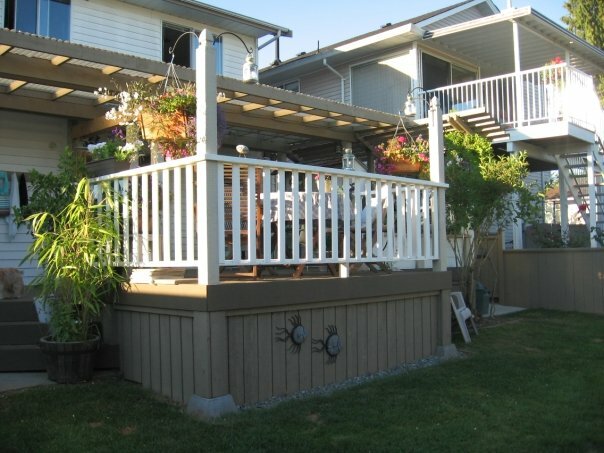 We started with a “wanted” list for the backyard deck, placing privacy firmly at the top. 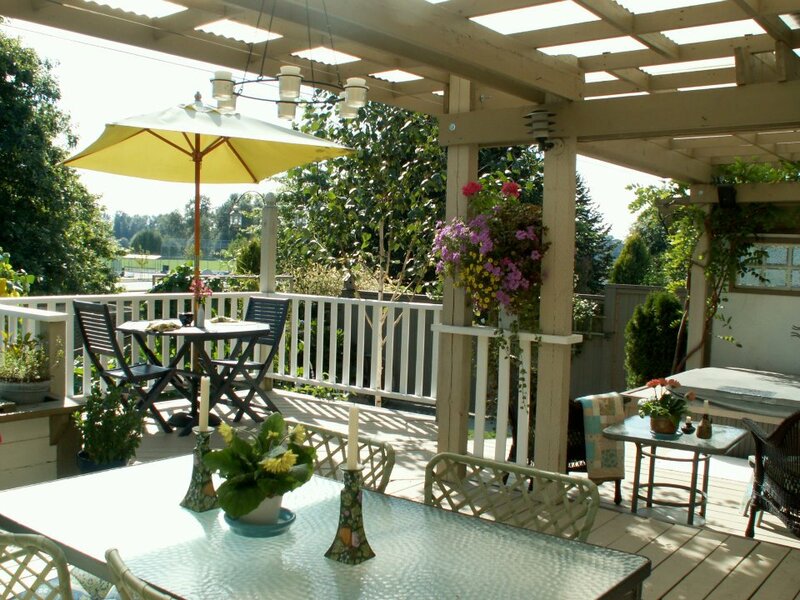 The other wanted items were: solid fence, hot tub, dining space, bbq, entertainment space, garden tool shed, larger vegetable garden, all together in a serene atmosphere. Here are the photos of what we built, bit by bit, over 4 years. The back deck photo when we purchased the house. On the left is the family room and to the right the kitchen. 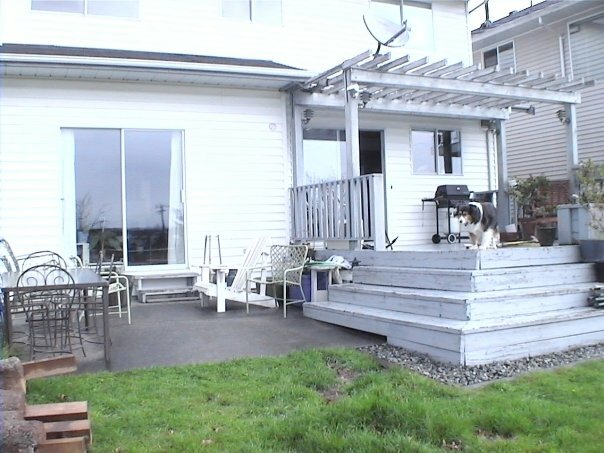 Both have sliding glass door access to the deck. Dave built an arbor, and covered it in clear roofing material. The roof spanned the entire length of the house. That created privacy from our neighbours balconies without blocking sunlight. Here the hot tub is being set and the sliding glass door has been raised up 6″ for interior reasons. On the left, a wisteria is planted and a wall was built with frosted glass cabinet doors, that I found on the side of the road. 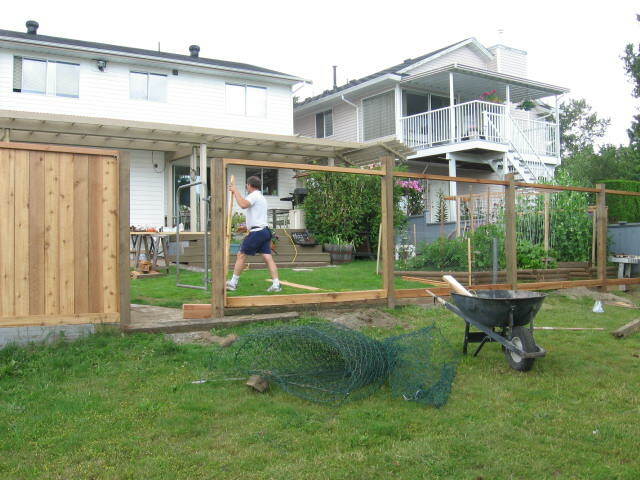 In a joint effort with our neighbours, we built a solid cedar fence to provide privacy from the park & athletic fields. This photo also shows how the arbor’s plastic roof blocks views from our neighbour’s balcony. 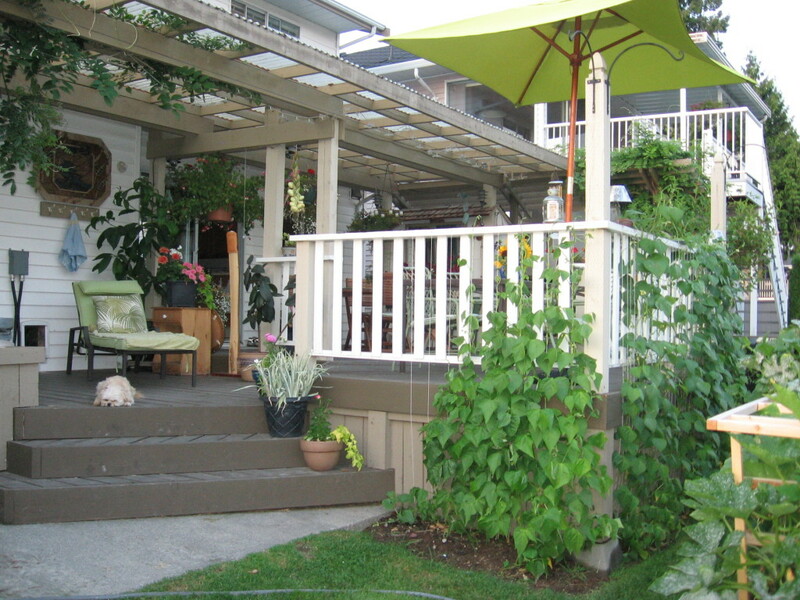 To expand the deck square footage, we covered the old stairs to turn it into a sunny dining area. The following year, we used the vertical space for a bumper crop of green beans. 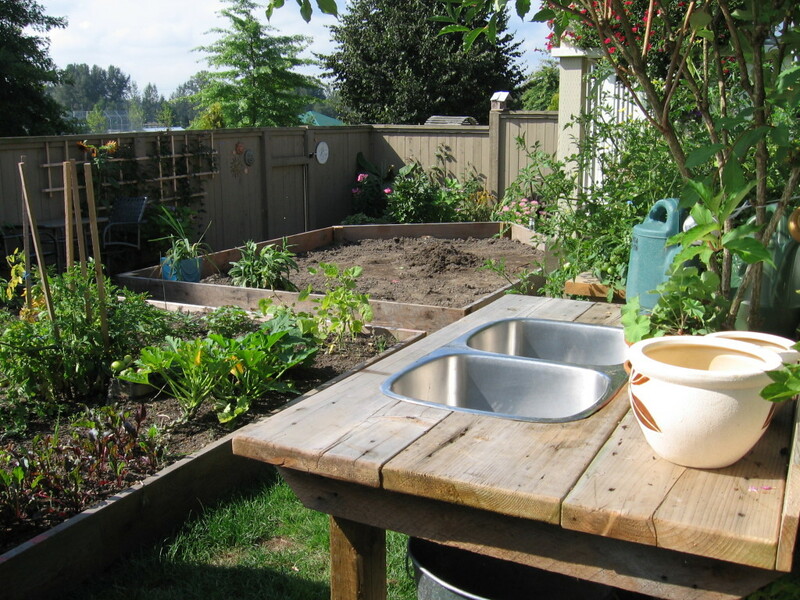 Another convenience that we added to our garden area was a vegetable washing sink. The sink part was found at the Recycling center for $5. I built a sink table stand with some leftover garden planks and a few fence post ends. The sink came with some plumbing attached so Dave just added a couple more pieces of piping to direct the waste water away from my feet and into the garden. A vegetable sink washing station. Waste water (from the hose) was redirected back into the garden. The sink table was set up close to the compost bin for easy disposal of vegetable scraps.